Beware! Before you let a critic’s question put your faith on trial, put the question itself on trial. Judge it for legitimacy—it might be deceptively illegitimate. Speaking of trials, such sophistry is routinely rejected in real-world courtroom trials, such as when a witness is asked a question that prematurely presupposes unproven facts. What if the question assumes wet weather associated with some event yet there was no report of rain at that time and place? Or what if the question is about how certain medicine dosages affect humans yet there is no evidence of those dosages being tested on humans? The proper response to a false hypothetical in a courtroom context is: “Objection, the question assumes facts that are not supported by the evidence.”1 However, most people don’t play by forensic evidence rules, so unsubstantiated assumptions (including groundless name-calling) are often used as a substitute for real proof.2 So, how should we, as believers, respond? Reply that such questions are defective and misleading as asked because they contain false hypotheticals that require assuming unproven allegations. To the Massachusetts challenger, I countered: “You assume that Scripture contains scientific errors, but I reject that assumption. 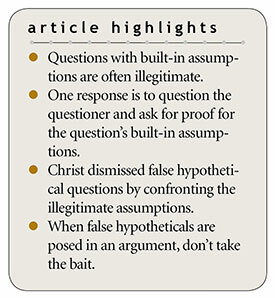 You need to identify a few examples of these so-called errors—or even just one—then we can discuss your question using specific topics that exist in the real world.” Unsurprisingly, the challenger had no example available despite his boast that Scripture contained lots of errors.3 Like him, other skeptics often ask similar questions using false hypotheticals as bait in debate-like discussions. When they do, tell them they may be entitled to their own hypotheticals but not to their own universe—God rules the real universe. The Lord Jesus illustrated this when He dismissed a question as illegitimate while faulting the Sadducees for ignoring God’s Word and God’s sovereign power over human affairs.4 Random hypothetical scenarios are not guaranteed to occur in the universe just because we can imagine them. God’s truth rules and matches the real world. In summary, don’t automatically assume that a hypothetical scenario can occur unless and until there is real evidence that it actually does occur. God’s Word is sure. God makes sure that the universe never contradicts what He has said in Scripture. God’s truth rules and matches the real world. So, don’t be baited by false hypotheticals! Missouri, Kansas & Texas Railway Company of Texas v. Williams, 133 S.W. 499, 502 (Tex. Civ. App. 1910). “The question assumes that the [train station] depot room was wet. The evidence does not show that the depot was wet, and therefore the question was error. Hypothetical questions must be based on facts proved…[otherwise] the answers to such questions are merely speculative and not pertinent to the investigation.” See also McDowell v. Eli Lilly & Company, 2015 WL 845720, *6 (S.D.N.Y. 2015). “False hypotheticals are not accepted as reliance evidence.” Dallas I.S.D. v. Simms, TEA Dkt. 130-LH-705 (CIHE 9-10-AD2005), page 10 (allegations alone, unsupported by reliable proof, are inadequate, because this would require assuming critical “facts” not provided as evidence), applying Peaster I.S.D. v. Glotfelty, 63 S.W.3d 1 (Tex. App.—F.W. 2001, n.w.h.). To illustrate name-calling devoid of supporting proof, read Wikipedia’s entry on Institute for Creation Research to see how it unjustifiably labels ICR as “pseudoscientific” because ICR rejects deep time, natural selection theory, and Big Bang cosmogony. Nevertheless, the skeptic argued that his question deserved an answer, because maybe “modern science” would/could/might somehow disprove some Scripture details. Obviously, Christ Himself disagreed with that attitude—and Christ’s knowledge outranks any skeptic’s speculations—so accommodating and endorsing skeptics’ speculations are both needless and unwise (Matthew 5:18; John 5:44-47; Luke 16:31). Also, notice in 1 Timothy 6:20-21 that careless attention to so-called science causes many to err from the biblical faith. Not all imaginable hypotheticals are possible in a real world because God ultimately selects which scenarios He is willing to allow. Consider the discussion in Matthew 22:23-29 about serial marriages. Cite this article: James J. S. Johnson, J.D., Th.D. 2019. Beware the Bait of False Hypotheticals. Acts & Facts. 48 (2).